Okay, who is Chuck Miller? I’m a writer and photographer. Born in Massachusetts, but raised in New York, so technically Albany’s my home town. Go Patroons! Oh wait… they did go. Twice. I’ve written books, magazine articles and newspaper columns, beginning in 1990. My work has appeared in several national and regional publications, and my photographs have won various competitive awards. When did you start writing blogs for the Times Union? My first blog post for the TU was on August 25, 2009. I previously authored a series of independent blogs through blogspot.com, and Times Union blog boss Michael Huber asked if I would be interested in joining his growing family of TU bloggers. When did you stop writing blogs for the Times Union? My last blog post for the TU was on March 31, 2017. Why did you stop writing blogs for the Times Union? On April 1, 2017, I posted an April Fool’s Day post about how KellyAnne Conway would be the keynote speaker at the University at Albany. One of the trustees at UAlbany – George Randolph Hearst III – did not appreciate the prank, and contacted the Times Union’s publisher, Rex Smith, to pull my blog, which he did. I felt that was an over-reach and a violation of my blogging agreement with the company – in that the bloggers were to be left alone and not censored. With that, I walked away from the company and have not looked back. What is this “Street Academy” you keep speaking of? 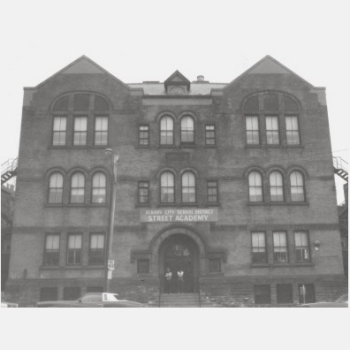 The Street Academy of Albany was an alternative high school, formed in 1969 by Sister Maryellen Harmon, RSCJ, as part of an attempt to provide a high school education for troubled youth in Albany’s inner-city neighborhoods. The school operated under that name until 1993, when it was rebranded Harriet Gibbons High School (Harriet Gibbons was one of the school’s first principals). The school closed permanently in 2010. I attended Street Academy from 1979 until I graduated in 1981. No, what is this “Street Academy” trivia team you keep speaking of? When I first played competitive team trivia in 2005, I needed a team nickname. I chose it and it stuck. I played as a solo entity until 2009, when Jeremy McNamara and Alexis Curry joined my team. I’ve had other members on the squad from time to time, but the core of the Street Academy trivia team is myself, Jeremy and Katie. So far, the Street Academy trivia team has nailed two Trivia Bowl championships (2007 and 2010), two victories at the Elbo Room money tournament (Spring 2010, Winter 2012), and three Summer Bowl championships (2010, 2012, 2014) – thus making the Street Academy trivia team the winningest trivia squad in the Capital Region. Bar none. Sounds like you’ve had a great life. No, it sounds like I’ve survived a rough childhood to put together a semi-literate and cognizant life. You’re a writer – anything you’ve written that I might have heard of? Besides this blog? I’ve written two guides on record collecting (under the Warman’s line of collectibles books), as well as several photographic art books (including Ghost Signs of the Capital District, as well as 2010: The Last Year of Kodachrome Film and three volumes of Motivations inspirational art books). Oh yeah, and there was also a fiction novel (The Robins of Iverhill). Oh yeah, what was the deal with that Robins of Iverhill thing – I saw a few blog posts about it. In 1985, I wrote it as my senior thesis for college; then I packed it away and forgot about it. In 2010, I found a copy of the original manuscript, and started re-editing it – and blogging about the experience of re-editing it. Eventually I got it published, and now it’s available in paperback form through Amazon. In December 2011, I added four more holiday stories to the Iverhill Universe, including “The Black Oak Elementary School Sledding Championship,” “The Note,” “The Picture and the Wallet,” and “Sleeping With Gretchen Peters.” I added a Father’s Day story, “1:35 a.m,” in 2012, and one more Christmas story, “Santa Claus is Cool,” for Christmas 2012. A new Christmas story, “I Love You, Steve Kaplan,” was printed in Christmas 2014. A final Christmas post was added in 2017. What type of camera equipment do you have? Let’s see… My digital camera is a Nikon Df. It’s my fourth digital camera and my third DSLR, having surpassed my Nikon D700, my Nikon D70 and my Nikon CoolPix 800. A Krasnogorsk FT-2 (ФT-2), also known as a Фотоаппарат Токарева, or “Tokarev’s Camera,” for panoramic shots. A NIMSLO four-lensed film that was originally designed for lenticular 3D prints. Although I enjoy shooting in digital format, I also appreciate being able to shoot with film. There are so many strengths in using both formats. Most of my interchangeable lenses are Nikon or Nikon-compatible “F-mount” lenses. My favorite telephoto is an F/2.8 80-200 that I got from eBay when the previous owner took off the rubber grip and wrapped the chassis in tennis racquet leather (creating the only camera lens with Prince sponsorship). My favorite fisheye lens is a Kiev Mir-20H manual focus lens; it came all the way from Siberia and smelled like boiled cabbage; I had to wrap it in fabric sheets and store it in a box for two months to get rid of the smell. I use Cameraworks in Latham to clean the CCD sensor on my digital cameras; whatever lenses and film I don’t get on eBay come from B&H Photo in New York City; my film is often developed at either Ritz Camera or McGreevy Photo Lab; some special film gets sent to Dwayne’s Photo in Parsons, Kansas, or to DR5 processing in Denver, Colorado. From kindergarten until my high school graduation, I attended twelve different elementary and secondary schools. This was a by-product of my family moving from one location to another, and also a by-product of school districts that relegated certain grades to their own specific buildings. Street Academy of Albany, Albany, N.Y. (eleventh, twelfth grade). South Corinth Elementary School, South Corinth, N.Y. Fuji Velvia 50 film, Ansco Cadet 127 camera. Photo by Chuck Miller. Street Academy of Albany, Albany, N.Y. Photo from 1980 high school yearbook, photographer unknown. 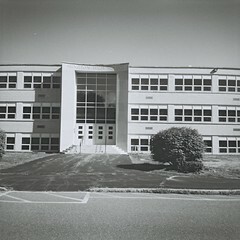 Abington High School, Abington, Mass. 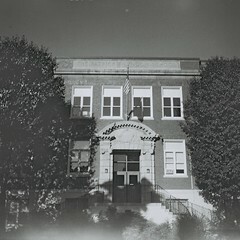 Efke 100 film, Kodak Brownie Super127 camera. Photo by Chuck Miller. Patrick F. Lyndon Elementary School, West Roxbury, Mass. Efke 100 film, Ansco Cadet 127 camera. Photo by Chuck Miller. What was the Pontiac 6000? In 2004, I convinced my paternal grandmother – who was 92 years old and had both cataracts and a valid Massachusetts driver’s license – to part with her car lest she end up in an accident. The car was a 1991 Pontiac 6000, and I spent a considerable amount of time and effort refurbishing it. The car lasted from the date of my initial acquisition – 2004 – until March of 2010, when it finally perished, having traveled 153,000 miles in its lifetime. Did I actually see that car in a movie? Yep, it was one of the “car extras” in the Angelina Jolie action film Salt. You can see it for about two seconds at the end of a car chase scene as Jolie’s character rides past it on a motorcycle. Cardachrome was the nickname of my 2005 Saturn Ion, which I owned from March 2010 to November 2012. It was a dependable car, and it achieved a decent gas mileage. It earned the nickname “Cardachrome” because as I was cleaning the car after a photo shoot, I came across an old box of Kodak Kodachrome film. Kodachrome, Cardachrome, it just worked. Cardachrome lasted until November 2012, when it developed a series of electrical problems that made me lose confidence in its ability to get me from Point A to Point B. That was the nickname of my third car, a jet-black 2006 Chevrolet Cobalt SS. I purchased it in 2012, paid it off in 2015, and drove it all over the Northeast. In June 2016, on a trip back from Florida, the car was destroyed in a front-and-rear-end collision. Dracourage – a combination of the words “Dragon” and “Courage” – is the name of my fourth car, a candy apple red 2013 Chevrolet Cruze. What’s the deal with you and this “split film” photo discipline? Coca-Cola Relieves Fatigue, 5 cents. Photo by Chuck Miller. 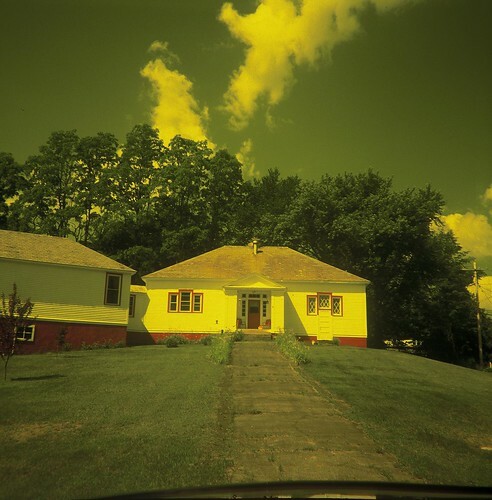 In 2010, I experimented with putting two rolls of 35mm film into my Holga 120N. The result is that the film looks like a layered jigsaw puzzle. Really good stuff. In fact, PetaPixel even wrote an article about my technique. 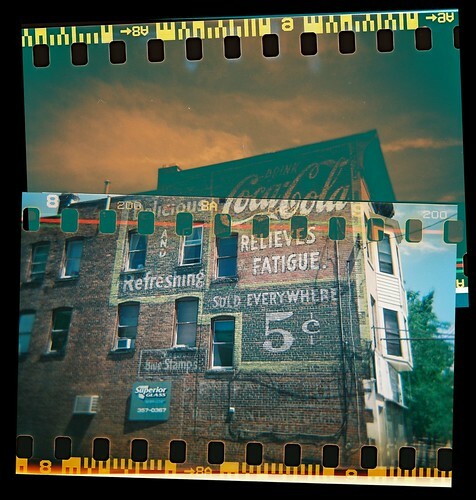 The photo at left, “Coca-Cola Relieves Fatigue, 5 Cents,” was my first attempt at split-film photography; it later won an award at the 2010 New York State Fair’s Photography Contest. I’ve evolved the “split film” discipline into another discipline, the “Swiss Roll” technique, in which I roll a 35mm film into a 620 or 616 film, and then expose both films in the camera at the same time. What’s the deal with you and vintage film? In April 2011, I tried an experiment – I loaded a roll of 120 film that had an expiration date of 1959 into the Rolleiflex. The pictures actually came out reasonably well, and eventually the photos were retweeted and re-linked through everyone from PetaPixel to Gizmodo to Popular Photography. Swank in every sense of the word. What’s the deal with you and Rocky Mountain Film Lab? In 2010, I sent a roll of undeveloped Kodacolor C-22 vest pocket film – a roll I discovered in an old camera – to Rocky Mountain Film Lab to have it developed. Unfortunately, I discovered later that Rocky Mountain Film Lab has a tendency to accept film – accept payment – and then you have to accept that they’re not accepting anything else. Were you actually a DJ on the radio?? For about six months, yes. From September 1987 to March 1988, I worked for radio station 3WD in Schenectady (it’s now True Oldies 1240 WVKZ). Trust me – you’re not going to make a fortune in radio; they do take taxes out of minimum wage. So where is this ‘K-Chuck Radio’ I hear so much about? K-Chuck Radio is my own Internet blog radio station, in which I gather several songs together around a certain theme – same artist, same songwriter, same lyrical progression – and make them available in a blog post for you to see and to listen to. And no commercial interruptions, either! What’s the “Royale With Cheese Movie Club”?? Somehow, I never got to see Pulp Fiction when it originally came out, or during the next 20 years or so. Finally, I found a VHS copy of the film, and I sat down and watched it. Using a famous line from the film, my “Royale With Cheese Movie Club” is for films that everyone else has seen – but I haven’t. And now I’m finally getting around to seeing them. Don’t give me guff because I haven’t seen them yet – just give me guff for it taking so long to actually watch them. Collarworld is a place where our pets go, after they’ve passed away, to wait until they reunite with us. I’ve written nearly 40 chapters in this fictional series, which I retired in early 2018. In January 2012, I found a Queen Anne-style window frame – a center panel surrounded by smaller panels – in a furniture salvage store. I replaced the center panel with a photo and swapped out colored stained glass for the surrounding panels. Thus was created The Dream Window of Kenwood Avenue. I built a second window in August 2012, Dream Window 2: The North Pearl Street Limited, and am currently working on subsequent Dream Window projects. I call them “Dream Windows” because, upon looking through them, I can see portions of my past. I’ve actually finished my FOURTEENTH Dream Window, and many of them have found new homes in private collections or as fundraisers in charitable events. What is this “TU Sez No Curse Words” graphic that keeps popping up now and again on this blog? Here’s the deal. When I blogged with the TU, they had an issue with bloggers using curse words and vulgarities. Rather than use a mixture of ampersands and commats, like the text in a cursing comic strip balloon, I created a graphic that automatically pops up whenever I need to curse, or if someone uses profanity in a blog comment. Let me test it out for you. I think you’re a piece of for using a ing blog filter, and if I want to ing curse like a longshoreman, I’ll use all seven of the ing words that George Carlin says you can’t use on TV.